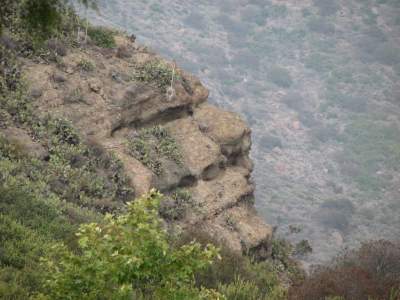 I think it looks like a face. 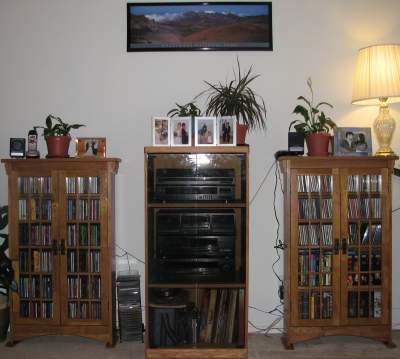 We bought new cabinets for the stereo and our CDs. The CD cabinets were custom made and I was very happy with how they turned out. We got our sofa and love seat from the same place, K C Furniture. Check ’em out! As I noted elsewhere... I have a fondness for Coca-Cola that, well.. is just unhealthy. Fortunately, Mrs. splorp! allows me to enjoy my little sickness. She bought me the clock you see above. But wait! There's more! On the opposite wall from the clock... is another clock! This one is from my Aunt Carole. The large Coke sign in the middle we got in from the Coca-Cola store in Las Vegas. The small, mirrored sign to the left we bought in Paso Robles, CA. The hotpad is from my ma. The Norman Rockwell-esque one on the right is a gift from my cousin, Tommy, who passed away a number of years ago. There will be more images of Coca-Cola paraphernalia in the future.